For a slice of a geography lesson with your next luxury travel experience, we have just devised our latest tectonic adventure with the aim of teaching you all about the natural beauty of Iceland. Follow us and lift the lid on Þríhnúkagigur Volcano and see exactly what this geological behemoth is all about as you descend deep beneath the surface of the earth into the giant magma chamber of this dormant volcano. 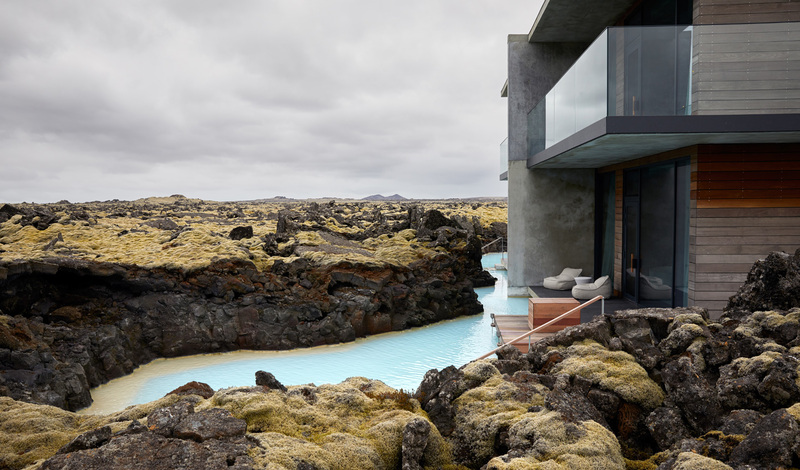 A veritable once in a lifetime and an Icelandic exclusive, it makes for an explosive getaway. Packed full of luxurious stays and geographical wonders along the way, spend six nights getting beneath Iceland’s skin in a way you’ll never forget. This is a trip with no messing around and after having caught a good night’s sleep at Canopy Hotel in Reykjavik, we’re throwing you straight in at the deep end as you head out to the intimidating Þríhnúkagigur Volcano. With your science-savvy guide in tow, you’ll descend through the crater opening and down to the floor of the chamber using an open elevator system before a privately guided tour of the vast chasm teaches you about the immense pressure and complex processes that caused this natural marvel to form over millions of years. Having caught a glimpse at the workings of the earth, we’ll then pull you back out of the volcano again and whisk you off for a VIP tour of the Hellisheiði Power Plant. Here, surrounded by fields of lava and moss, you’ll get a first-hand look at how Iceland produces so much green and sustainable energy, before heading back into Reykjavik for an evening at one of the many trendy restaurants. In the morning, it’s out of the city and into the Golden Circle with a visit to the geographically stunning Thingvellir National Park. A walk past the spectacular Gullfoss waterfall and through the geological fault known as Almannagja will then bring you to the Silfra fissure. A crack in the earth’s crust marking the spot where the European and American tectonic plates meet, there could only be one response and that is to don your snorkel and dive into the clearest water on earth. Visibility often reaches over 100 metres and as you slowly drift down the crystal clear channel, gaze down between the continents and experience the feeling of total weightlessness. Climbing out, you can then dry off and warm off at your hotel for the next four nights; Hotel Ranga. Blazed over by the Northern Lights in winter and the Midnight Sun in summer, it’s the ultimate adventurer’s getaway. After a good night’s sleep, you’ll take to the waters once more – but by boat rather than dry suit this time as you head out to the Westman Islands. An archipelago of just 15 islands, littered along the South Coast, they are steeped in history and culture – and the landscapes aren’t bad either. More than that though, they are home to Iceland’s largest puffin colony making this the perfect trip for birdwatchers as you visit Stórhöfði and meet Tóta, the most famous Puffin in the world. History-lovers meanwhile, will be drawn to the Eldheimar museum and its exhibit on the excavation of lava engulfed houses destroyed by the eruption of Eldfell Volcano back in 1973. Step back in time with a hike up the volcano to enjoy breathtaking panoramas over the islands’ and their colourful lava fields. After a well-deserved dinner and a good night’s rest at Hotel Ranga, it’s time for even more volcanoes. We have arranged for a scientist specializing in volcanology to accompany you all day today to explain the amazing processes going on both above and below ground. Climb aboard a super jeep and head for the Eyjafjallajokull Volcano and explore the space-like landscape studded with huge formations of recently cooled lava its eruptions have left behind. Gazing into the vast crater, you will immediately get a sense of the immense power bubbling under the surface. Trek up the volcano on an hour or so hike across the lava field – or if you fancy elevating the experience that bit further, why not take a helicopter flight from the back garden of Ranga over Eyjafjallajokull to get a bird’s eye view of the lunar landscape? Whizzing past the stunning Seljalandsfoss waterfall, Gígjökull glacier tongue and Nauthúsagil canyon, it will surely be worth it. Your final day will see you heading back towards Reykjavik and out onto the Reykjanes Peninsula. Rugged and wild, this stretch of coastline is pockmarked by hot springs, tectonic rifts and volcanic craters with the endless lava fields leaving you to feel as if you’ve come to the ends of the earth. 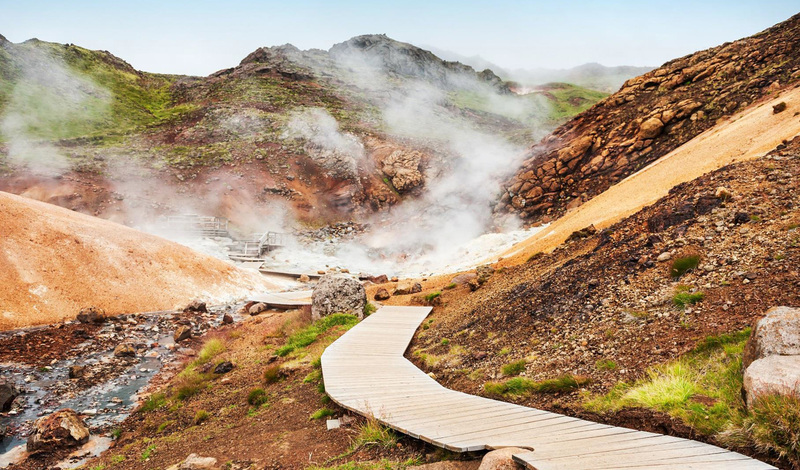 Out at the Krýsuvík geothermal area, you’ll be left transfixed by the mud springs that boil away in the ground in all different colours before continuing onto the Mid-Atlantic Ridge where you’ll cross over the bridge between the continents in a most awe-inspiring setting. In the afternoon, amp things up on a private ATV tour across the Krísuvík peninsula, over Festarfjall mountain and onto the black sand beach of Selatangar. Pausing atop Hagafell mountain, you’ll be treated to beautiful views of the Blue Lagoon and neighbouring Eldey Island. Recoup with a night at the incredibly soothing Retreat at Blue Lagoon and a dip in the therapeutic azure waters as you relax into geothermal bliss. Tomorrow, home awaits.